Clearinghouses are aggregators (senders and receivers) of electronic claim information almost all of which is managed by software. Clearinghouses are electronic stations or hubs that allow healthcare practices to transmit electronic claims to insurance carriers in a secure way that protects patient health information, or protected health information. Clearing houses offer medical billers and billing managers a way to consolidate all their electronic claims and manage them from a single location, from an online dashboard control panel, similar to online checking. As discussed above, in the times of increasing patient responsibility, the Clearinghouse must provide both real-time and batch mode of insurance eligibility verification. Insurance Eligibility can often be implemented within the EMR as well as the Practice Management (Billing) modules. The key requirement is that you must enroll for the feature with your chosen clearinghouse. The clearinghouse communicates with your EMR / Billing System and performs the benefit checking based on the patient’s demographics and insurance as entered under Patient Register. In addition, the individual insurance company assigned to the patient’s insurance history must have the appropriate electronic payer ID as assigned by the clearinghouse. Eligibility verification on the front-end also identifies which services require co-pays or co-insurance and deductibles the patient is responsible for. If the practice has collected the credit card details from the patients at the time of check-in, patient responsibility can be collected at the time of providing service or exhaustion of insurance benefits. The Clearinghouse assists in compliant coding of patient encounters which enables to acclerate reimbursement and also reduce potential audit risk. Even while the Clearinghouse may provide a comprehensive list of claim edit rules, the Clearinghouse software must be programmed to 'learn' from experience to consistently improve first-pass rate. In an ideal situation, the Clearinghouse must be able to send all the claims to all the payers electronically. However, that may not always be the case since there are always a number of small payers that may not be set up for electronic submission of claims. In such cases, the Clearinghouse or your staff may be able to print the claim on paper and mail it to the payer. Additionally, the Clearinghouse must be able to provide an initial response rather quickly enabling the medical billing staff to fix the claim and re-submit it without any loss of time. Clearinghouses also provide connectivity to payers so that ERAs (Electronic Remittance Advice) are received by your billing software which can interpret and post payments to patient accounts in an automated manner. This helps in streamlining the workflow and improving your office productivity by knowing in advance which claims have been paid and in what amount. You can also process your secondary claims much faster and shorten the number of days your receivables are outstanding. ERAs are returned in a consistent and easy-to-understand format and you can quickly search, view or print each remittance as needed. Online ERA management tools offered by the Clearinghouse also enable you to categorize and correct your denials and manage the appeals process. Denial Management starts from denial prevention. Since the payers keep changing rules regularly, you may not be in a position to completely eliminate them. However, the quality of claims scrubber and eligibility verification can definitely help reduce the probability of denial. Denial management tools can help you manage denials and ensure that each denial has been addressed by identifying the root cause so that it can be prevented in future. The best situation is when you can charge the patient at the time of providing service as soon as patient responsibility has been determined. If that is not the case, the Clearinghouse can print and mail the patient statements which can be more cost effective for your practice. Delivering actionable and relevant metrics in the form of dashboards and real time reports can enable a practice to uncover problems and take remedial actions. Such reporting must include benchmarking the practice performance against industry peers as well as measurement of staff proficiency to pinpoint variability amongst team members. Clearinghouse tools could also allow the practice to spot rejection and denial trends. Each transmission is carried out over a secure connection as required by HIIPAA (Health Insurance Portability and Accountability Act). Catching and reducing errors: John Hopkins Medicine quotes a study which says that 250,000 deaths occur in the US every year due to medical errors. Some of these errors are due to erroneous data entry. Medical clearinghouse software catches errors that a user may have made during a data entry process. For instance, it can pick up on typos made while collecting patient information during the data entry process for a claim. And since they already have every insurance provider’s data in their system, it reduces the amount of errors you can make while transmitting claim information. Secure data transfer: Clearinghouses act as electronic hubs that allow healthcare practices to transmit claims to insurance providers in ways that secure PHI (Protected Health Information). According to Healthcare IT News, the average global cost of a lost or stolen record in healthcare organizations amounts to $355 per record. Data theft costs industries millions. A resource that eliminates this possibility therefore is worth its weight in gold. Backup claims information: Manage all of your claims information in one source. Fast and clean claims submission: Submit all of your claims to different insurers at the same time. Paperless claims management: Since a medical clearinghouse relies on software to process claims, it eliminates or reduces the need for healthcare providers to rely on paper records like claims forms. Accurate data: Your practice receives accurate data which can help you make precise revenue forecasts with shortened payment cycles. Saves time: With a medical clearinghouse, you spend more time treating patients and less time billing them. When looking for potential vendors, see if their price packages suit your budget. Ask them for a summary of costs. Depending on your preferences, you can go for a cloud-based SaaS (software-as-a-service) product or a web-based application. Ask how much each vendor charges for subscriptions and extra fees. For example, some clearinghouses might charge you extra for ERA (Electronic Remittance Advice). EHR and medical billing software must be compatible in order to be a “one stop solution” for a medical practice’s IT and billing needs. Check whether your chosen clearinghouse offers a solution that works seamlessly with the software your staff currently uses. For example, if you use EHR software to manage or process patient information, make sure that it’s compatible with the clearinghouse’s software. Does the interface have components that can help you go through basic operations easily? Are claim errors written in a language that your staff can easily understand? For example, to ensure usability, the clearinghouse should enable you to verify patient eligibility in real time and offer advanced search options for data access. Premium clearinghouses offer support from experienced billers in real time. For example, in case of rejection, the clearinghouse software should have a chat option that gives you access to experienced billers. These billers can point out mistakes that lead to the rejection. You and your staff should be able to edit or see the status of sent claims at all times. The clearinghouse should be available 24/7 and should therefore provide online access. Navicure recently merged with ZirMed and now operates under both Navicure and ZirMed brands. The revenue cycle management company offers a one-stop cloud based software solution (ClaimFlow™) that streamlines medical billing processes from initial claims submissions to analysis of patient eligibility, claims editing, remittance, denial, and appeal management. The company has received four “Best in KLAS” awards, including one this year. Availity is a free Florida-based service that offers medical practices clearinghouse and revenue cycle management products. It offers access to a secure multi-payer portal (Availity Portal) that provides users with access to multiple health plans, allows them to check eligibility, and acquire real-time authorization. The health information network recently won the Governor’s Business Ambassador Award for its contribution to the nation’s economy. Emdeon is the nation’s largest clearinghouse and is a leading provider of revenue and payment cycle management and clinical information exchange solutions, connecting payers, providers and patients in the U.S. healthcare system. Emdeon’s offerings integrate and automate key business and administrative functions of its payer and provider customers throughout the patient encounter. Through the use of Emdeon’s comprehensive suite of solutions, which are designed to easily integrate with existing technology infrastructures, customers are able to improve efficiency, reduce costs, increase cash flow and more efficiently manage the complex revenue and payment cycle and clinical information exchange processes. Office Ally is a HIPAA compliant clearinghouse that offers web based services to healthcare providers for free. It works with around 5,000 payers nationwide and offers 24/7 customer service, free setup, and training. Additionally, the service also allows medical practices to use their own software to create and submit insurance claims electronically. 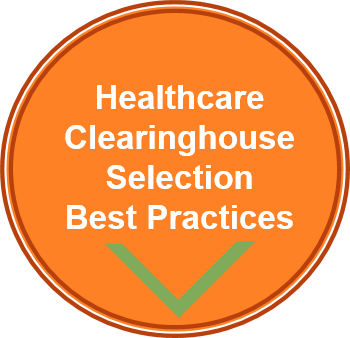 This post can help you choose the best clearinghouse for your medical practice. Partnering with the right company can help you streamline revenue cycles, improve cash flow, and maximize profits. Additionally, it removes unnecessary burdens on your billing staff, improves your relationship with insurance carriers, keeps revenue forecasts accurate, and shortens the payment cycle. RevenueXL gives you the freedom to work with any of the best Clearinghouses when you implement integrated EHR and Practice Management Software. Give us a call today to discuss your practice needs and to learn more about our specialty-specific EMRs—or schedule a live demo and see for yourself how easy and cost-effective switching to a new EMR can be.